The blogs I follow cover a vast range of genres. Posts about food, fashion and photography, creative writing and political satire, gardening, arts and handcrafts, social history and photography arrive on a daily basis from every corner of the globe into my WordPress reader. Since the Melbourne morning newspapers no longer engage me, I read blog post installments while I enjoy my morning coffee. About a month ago a delicious looking photograph on Laura’s Mess caught my eye. I had a busy morning planned so after a quick perusal I saved the link onto my IPad reading list and moved on. Last week while looking for another recipe, the same photo distracted me from my purpose. This time I looked at the post thoroughly. I read the recipe three times, incredulous that it was wheat free, wahoo! I was at my beach house when I first made Laura’s recipe. Having only limited equipment there, I made it entirely by hand and baked it in the one and only slab tin which was way too small. Consequently the base of the slice was much too thick but flavour was scrumptious. This less than perfect trial became the starting point for further development. I like textural contrast, and a zing of freshness in any food and prefer sweet things to be barely sweet, so after reducing the sugar significantly, I added lemon zest and macadamia nuts to the original topping recipe. I spread a smear of berry jam on the uncooked base before I upended the whole bag of fruit into the tin without checking the weight. It was just the right amount to cover the base, and the jam prevented to berry juices from making the base soggy. This is a seriously good fruit dessert/cake. It was wonderful served warm with whipped cream and luscious cut into neat squares and served for afternoon tea. Berries always seems luxurious to me, but the cost of frozen fruit is very reasonable, especially when bought as a weekly special. Preheat the oven to 180C, bottom element only setting, no fan if possible. Grease a slab tin 26cm X 30cm and line with baking paper. In your food processor or by hand mix together the flour, baking powder and oats. Stir in the coconut and sugar. Set aside 2 cups (roughly 250g) of this mixture for the topping. Mix the lightly beaten eggs into the remainder of the dry mix. Press the dough into the slice tin pressing down firmly with the back of a spoon. Mix the zest and chopped hazelnuts into the crumble ingredients for the topping. Spread the jam over the base in the tin then top with the berries. Shake the pan to settle the berries into a single layer. Bake until the base is firm and the topping lightly browned about 1 hour. The slice should feel firm to touch. Serve warm with whipped cream or thick yoghurt, or allow to cool and serve with a cup of tea. I can’t wait for berry season! I totally agree with your description, “This is a seriously good fruit dessert/cake.” How could it not be, with jam, berries, and a macadamia nut topping? Our berry season is right around the corner and this is a recipe I’ll want to revisit. Speaking of jam, though, that’s a great idea using it as a moisture barrier. I certainly never would have thought of it on my own. Not only jam but also egg white can be used as a moisture barrier on pastry. I loath soggy pastry, these tricks really do work. We are still enjoying the last of the berry crumble slice, there will be arguments over the last portion! Crumbly crumbles mixed with berries sound just perfect to have with my coffee right now; will have to imagine yours. I have an iPad too; what is this read it later thing you click? I don’t know of that feature but it sure would come in handy. After you have opened a post, then “send to” icon appears in the top right of the screen. Touch that and it will offer options. I choose reading list. When you do want to read the saved post, open Safari then touch the open book icon third from the right on the tool bar. Select the spectacles and there you’ll find the saved post. This feature is absolutely invaluable. Are you using the WP app? Hi Sandra, your crumble looks lovely. I love berries, pity they are so expensive here. Crumbles are my favorite dessert. You have created a masterpiece here. It’s pretty darn good, can’t deny it! Love those berries! Spelt is a wheat (Triticum spelta), but lower in gluten that most other varieties. 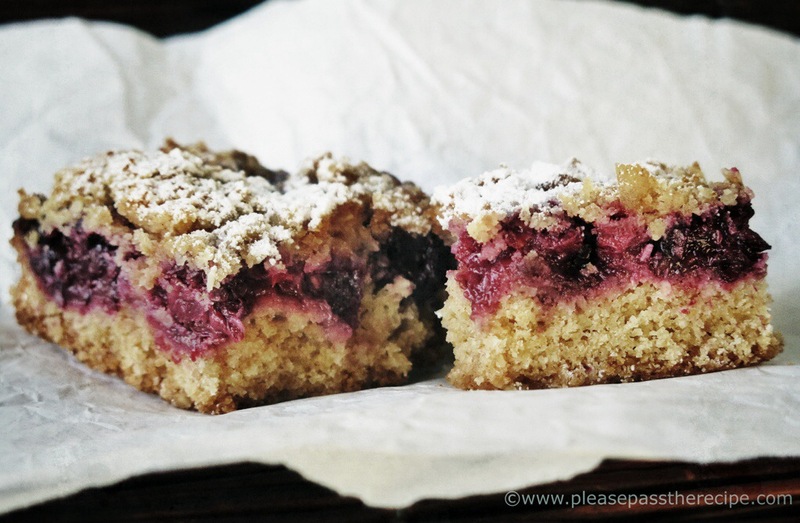 I love using spelt flour for its slight nutty taste – and in these crumble slices it must be fab! I am not a coeliac but have Fructose malabsorption syndrome. I cannot tolerate the bouncy gluten found in modern wheat. Spelt however has a different form of gluten, a stretchy form, and is generally well tolerated by those with my condition. I know it seems random but believe me, my gut can tell the difference! It’s texture is perfect in crumble and spelt would be my first choice regardless. I have friends who study traditional spelt cultivation. It’s what is called a relict crop since it grows in restricted (that is, agriculturally marginal) areas in Europe, but was once more widely spread. Yes, you are right about the different type of gluten content – similar to other ancient wheat varieties, einkhorn and emmer. All three are often marketed as farro. May do a post on it. 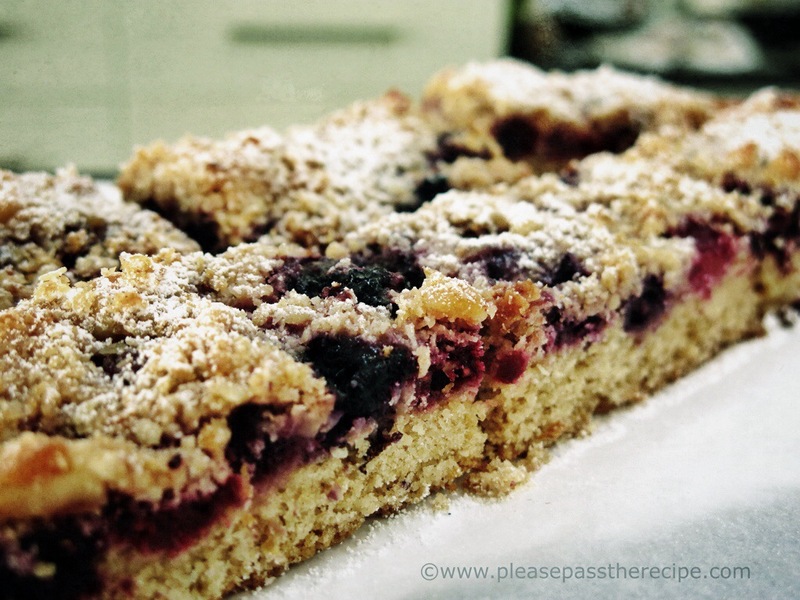 This entry was posted on April 22, 2014 by ladyredspecs in Cakes, Desserts, FODMAP diet, Food, Fruit Desserts, Light dessert, Slices and Tray Bakes, Sweet mouthfuls, Warm Puddings and tagged berries, crumble, dessert, FODMAP friendly, PUDDING, tray bake.